A guided walk over three of the stunning limestone hills of the White Peak area of the Peak District. You will be in a small group of usually no more than six people plus your friendly, professional walk leader. Throughout the walk your guide will 'bring the countryside to life' by sharing with you a wealth of local knowledge. From the village of Longnor we take paths and lanes to the tiny hamlet of Hollins Clough. After crossing the River Dove we walk around Hollins Hill for fine views along the route of the remainder of our walk. 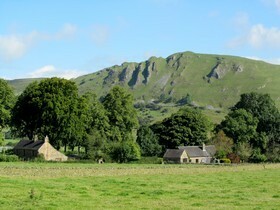 A highlight of the walk will include an ascent of Chrome Hill which is known locally as 'The sleeping dragon' because of its shape. We will be doing the classic 'Climb the Dragon's Back walk over Chrome Hill and then on to ascend via a ridge, the sharply pointed Parkhouse Hill which involves some easy scrambling. We then take a low level path around Hitter Hill to our final hill of the day which is High Wheeldon. If it is a clear day, there should be amazing views across the White Peak countryside throughout the entire walk. This is a hilly walk involving about 600 metres of ascent, some of which is steep. A head for heights is required on Chrome and Parkhouse Hills. The distance is approx 9.5 miles/15km. Chrome and Parkhouse Hills guided walk, with Cath Lee. We meet at 9:30am to be ready for a 9:45am start in the small cobbled market place near to the crossroads in the centre of the village of Longnor. You can either park in the market place or on the roadside nearby free of charge. The nearest post code is SK17 0NT. The Google map on this page that you can zoom in and out of shows the location. Not easily accessible by public transport.